There are many other high chairs on the market that only comply to BS EN 14988-1&2:2006, but this omission of the 2012 Safety Standard means that those high chairs are not compliant with the latest standard which includes a different safety harness. Please note that this version of the high chair is not the cheapest type of highchair in this style but with this one you are buying extra assurance for your home or business that is meets the current safety standards. The Eurobambino high chair is the UK's top selling Restaurant style high chair. Used by Restaurants and at home this very popular chair is our biggest seller and is made of environmentally friendly Rubberwood. The Eurobambino highchair is available in Natural and Walnut finishes, comes complete with safety straps and is supplied flat pack to save on transportation space and costs. Why should you choose Eurobambino for your high chair? * Fully Complient with BS EN 14988:2006 parts 1& 2. * Stackable reducing space required. * Safety Straps are included. * Can be pushed to table height. * Comes with rubber feet. * Foot print 50cm x 50cm. Want Extra Straps with your Eurobambino high chair? Want Seat Pads with your Eurobambino highchair? 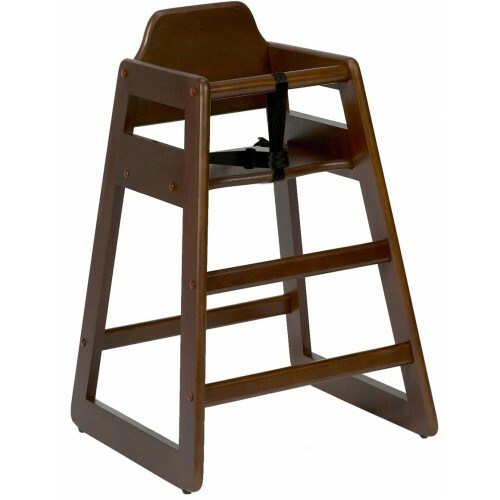 The Eurobambino Restaurant Style Wooden High Chair Be careful of other High Chairs that do no.. Replacement Strap for Eurobambino High Chair..
Insert Seat Pad for use with Eurobambino High Chair Please note :You are buying the pad ..